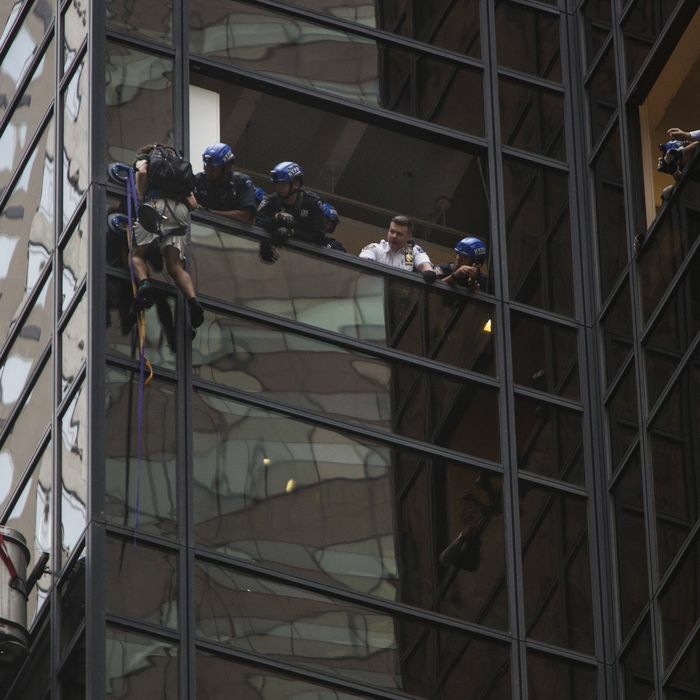 A 19-year-old Virginia man became a social-media star on Wednesday evening when he scaled Trump Tower using large suction cups, but the stunt failed to win him a private audience with the GOP nominee. The suspect, Stephen Rogata, began climbing the 68-story Manhattan skyscraper around 4 p.m., and managed to evade the police for nearly three hours as they attempted to stop him by breaking windows and ventilation ducts, and lowering themselves toward him in a window washer’s platform. Thousands watched on TV, livestreams, and from the street below. Eventually two officers leaned out of a 21st floor window and yanked him inside, head first. “I reached out. I took hold of his hand and I said, ‘Sir, would you come with me,’” said detective Christopher Williams. But people have gotten a bigger reaction out of Trump for posting offensive Hillary Clinton memes from the comfort of their home.